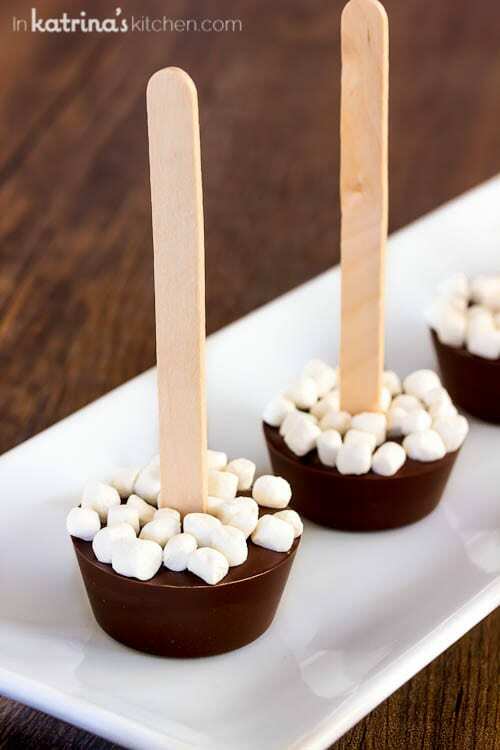 Use this Hot Chocolate Sticks recipe to make many variations for gifts or an easy and delicious hot chocolate bar! Try peppermint or salted caramel! 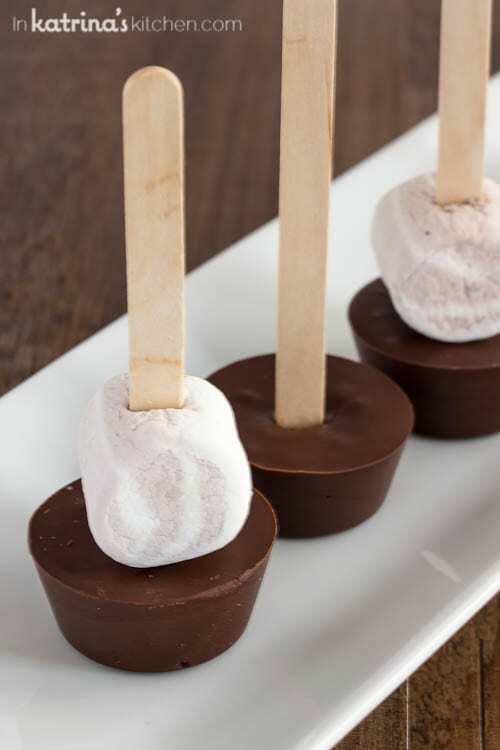 I’m excited to be a 2015 JET-PUFFED Blogger and share a few of my favorite sweet marshmallow treats. The best gifts are food gifts. Am I right? I’ve decided that everyone in my life would benefit from a creamy mug of hot chocolate. 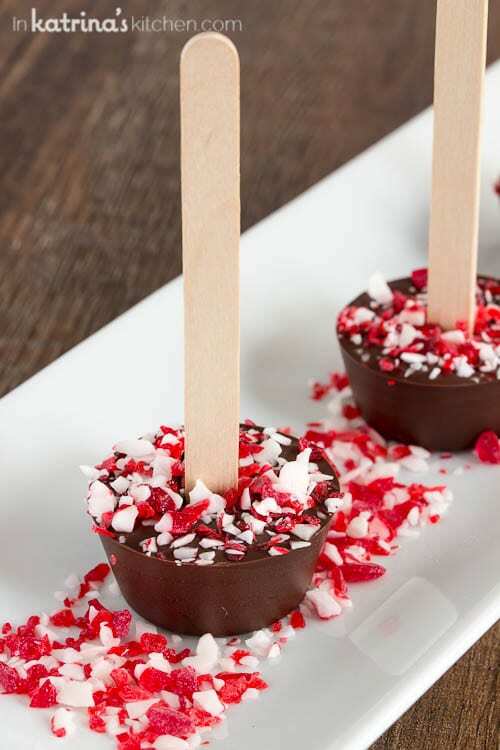 And since everyone is different these Hot Chocolate Sticks are the perfect gift to personalize- just dip and stir! 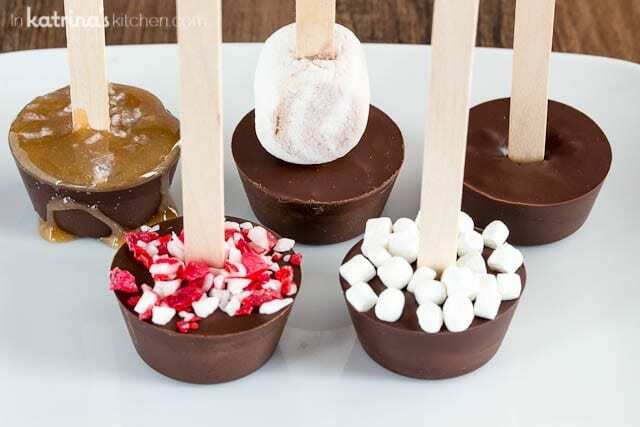 If you aren’t gifting these you can set up a fun hot chocolate bar for a crowd! The recipe comes together quickly with little fuss. Dunk in a mug of warm milk and stir until melted. Crushed peppermint is a personal favorite and popular this time of year. 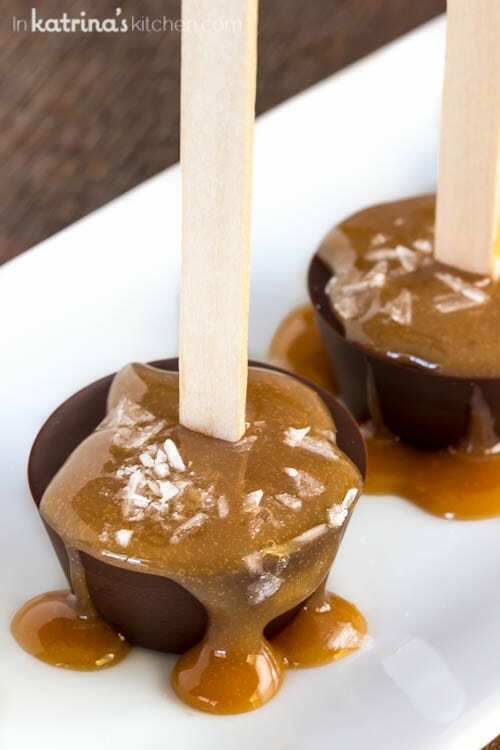 But can we talk about salted caramel? For gifts I think popping a marshmallow on top is adorable. I used JET-PUFFED Vanilla and Chocolate Swirled Marshmallows. 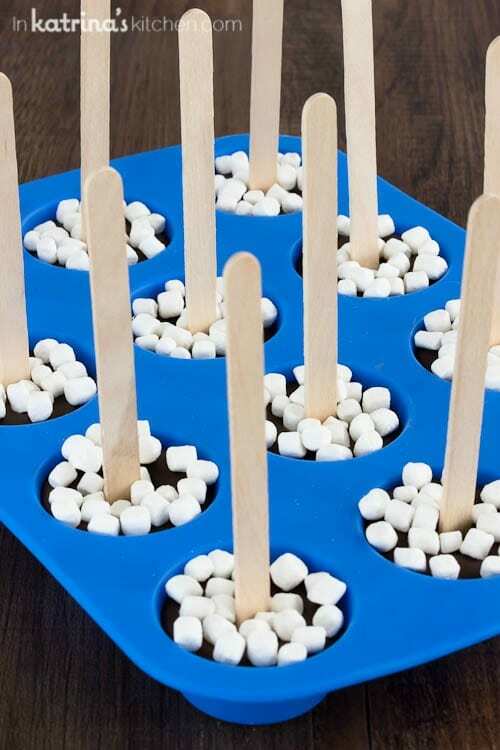 You may also use a large JET-PUFFED Marshmallows, or for a fun festive look you can use any of JET-PUFFED’s seasonal varieties such as Snowman Mallows, Peppermint Mini Marshmallows, Gingerbread Mallows, Holiday Mallows or their NEW Jumbo Red Velvet Cupcake marshmallows. Or keep it mini with my favorite JET-PUFFED Mallow Bits. If you make these in a silicone mini cupcake pan they easily pop right out. Alternatively you could use paper liners. 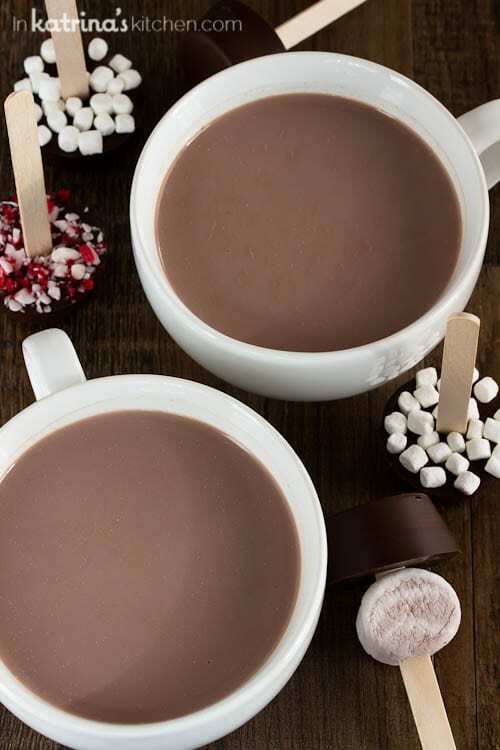 Use this Hot Chocolate Sticks recipe to make many variations for gifts or an easy and delicious hot chocolate bar! Try peppermint or salted caramel! In a microwave safe bowl melt chocolate according to package directions. In the bowl of your mixer fitted with the paddle attachment put confectioners sugar, cocoa, and salt. Pour the melted chocolate on top of the dry ingredients. Mix until incorporated fully. Place in a piping bag (or plastic zip bag), snip off the tip and pipe into 16 portions. Alternatively use a cookie scoop or small spoon. Mixture will be thick. If you use a silicone baking pan you can microwave it for 10-20 seconds after piping/scooping in the mixture. Top with JET-PUFFED Mallow Bits. Press craft stick into the center. Let cool 5 hours or overnight. Lift the silicone baking pan a few inches and drop once or twice (or shake) to get the chocolate to level out. 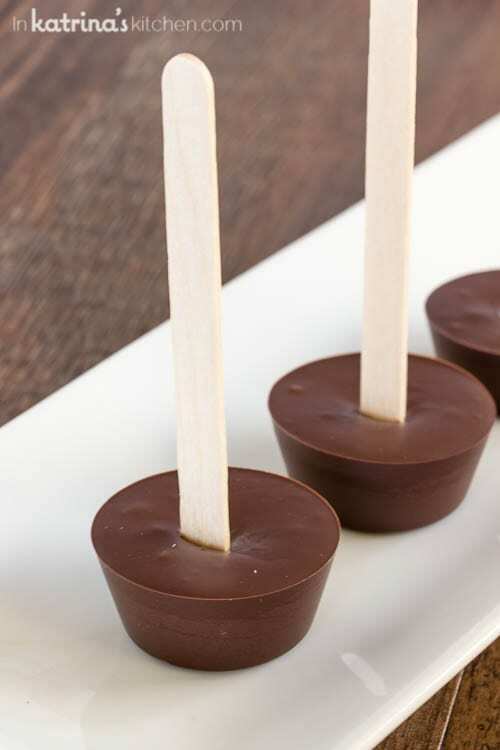 Check on the Hot Chocolate Sticks while they are chilling to be sure that the sticks are staying centered and upright. Connect with JET-PUFFED: Facebook | Twitter | Pinterest | Instagram | Google+ I’m happy to partner with JET-PUFFED to bring you marshmallow sweet treats all year long. As always, opinions expressed are my own. Thank you for supporting the brands that I work with, and for stopping back to let me know how your family loved my recipes as much as our family does! Wow they look amazing! What a great idea! So delicious and easy to make. Love it! Did youmake these in a mini tin? Tha look so good! My kids would love these! They’re so cute! I LOVE this idea! I need to make it for my kiddos! Those are so fun!!! And now I’m totally wanting a big mug of hot chocolate to sip on this afternoon!!! This is the cutest homemade holiday gift! What a perfect and fun way to enjoy hot chocolate!!! FACT-the salted caramel hot chocolate sticks just blew my mind! This would most certainly make my hot chocolate better! I LOVE THOSE TEENY MARSHMALLOWS! I want to make these and wrap them up all cute and gift them to myself for Christmas. Would that be wrong? How much hot milk do you stir this into? I stir it into about 6 oz of hot milk. Very good written article. It will be supportive to anyone who utilizes it. OH I can only imagine how delicious this is when you dip it into hot chocolate! All the different combinations and flavors you could make, YUM! How long will these keep for and how should you store them? Have you tried this in a muffin tin? I don’t have the silicone version and have to drive 45 minutes to a big box store that might not have them! Maybe wiping with a little Olive Oil Pam? Don’t want to put the work in to have them get stuck!! They worked! I made them at night, let them sit on the counter and stuck them in the fridge for the morning while I did my other baking and the popped right out. The only thing I would do different is not put chopped andes mints on top (I forgot to buy candy canes) because they turned “milky” in the fridge. Thanks for the recipe! I made this tonight. I doubled recipe. I also used 16oz (x2) semi sweet chocolate chips instead of the Baker’s bars. All I have is a crumbly mess! Can you tell me how to fix it? Unfortunately, you can’t fix it. Chocolate chips are designed to hold their shape. They don’t dissolve/melt in liquid. They seize. You need to use exactly what the recipe calls for. I did them in a mini-muffin tin with paper liners. And instead of sticks I found peppermint and caramel candy “spoons” (Wal-Mart). 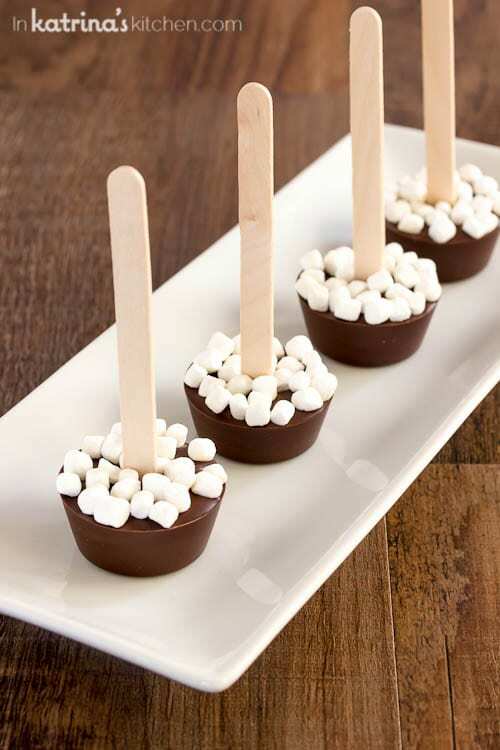 So I put one in each with the mini-marshmallows surrounding the spoon and they look awesome! They haven’t hardened yet (just finished them 20 minutes ago) but it seems like they’ll work. What I’ll do differently next time: I’ll definitely use a pastry sleeve. The spoon was a real pain. What silicone mini cupcake pan did you use? I was thinking of making this as a gift. How long do these last? Should they be frozen or refrigerated until used?